Endunamoo Strength & Conditioning: WWW: Food Prep - YEP! WWW: Food Prep - YEP! The idea is just so much work and I always thought it was overrated…. That is, until I came home for my hour lunch and it took me 45 minutes to measure, cut, figure out macros, etc. Then, I had to scarf it down in the car on the way to work and barely got to enjoy my lunch. Food prepping the day before or week before plays a HUGE part on sticking to a diet. If you have a quick lunch, it’s easy to go fast food instead of going home and trying to throw something together. But what if you have something already made? Ta-da!!! Best thing ever! It’s like coming home after a long day and realizing that you have to make dinner, walk in and remember that you did crock-pot for tonight and you have no work. You want to just drop to your hands and knees thanking God for such a wonderful creation. 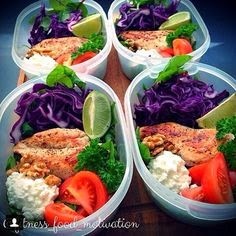 · Make sure you have lots and lots of Tupperware and Ziploc bags!!!!! · Have raw veggies in bags or containers already cut, skinned, etc. Weighed and ready to go. They make a great side or snack. · Always have meat cooked. Don’t worry about trying to make meals. You can do that throughout the week as you throw things together. Make an assortment, package it, and then you can mix it up throughout the week. For example, 4 oz. of chicken has been used as a snack, on Ezekiel tortilla, on Ezekiel bread, in rice, on a salad, and in a meat mix. · Always have green things in your fridge waiting for you. Spinach and broccoli are a big one at this house. They go with pretty much anything. · Hard boiled eggs literally go with anything, anytime. If you have done this before and have any tips for us new timers, we’d absolutely love to hear from you! One thing I can say that I have enjoyed about it is that I’m not having to cook every night. If I block off a couple hours out of a Sunday night, I can get to at least Thursday morning without cooking. It also helps with my moderation in eating. I can eat and not realize that I just ate a whole half gallon of ice cream or whole pizza or whole jar of peanut butter or pound of chicken. It’s just me. I like to eat. This way, I constantly know what I’m eating, how much, and what the macros are in them. I have sticky notes on them. Last tip, label your food and when you made it. And invest in a food scale. No, you don’t need a $50 one. Ours is $15 from Target and I’m pretty much obsessed. One of the best wedding presents ever. Adios Endu, and good eating!